Making pancakes and crepes every morning can get a little repeated, so add to your menu by simply using a different piece of equipment for the same ingredients! Don’t stick with the obvious! 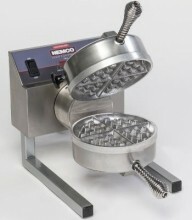 This Nemco Belgian Waffle Baker is a great accessory to add to your café, restaurant, home, bakery or commercial kitchen! Whether you are looking to simply make waffles, this top brand waffle maker will provide your establishment with endless opportunities! Easy to clean and easy to use, go ahead and try different recipes and types of food in this must-have kitchen appliance! A staple for hotels, buffets, cafeterias and various food service establishments, a commercial waffle maker can be used either behind the counter, or for self-serve operations!